Great value! These have held up so well with lots of boys and kids in the house. They wipe down well, and haven’t scratched. You can easily stack them and move them to where they are needed. Chic and sleek, these transitional counter stools are the perfect seating solution for your kitchen or home bar. Constructed from durable metal in a complementary charcoal grey finish, these industrial-inspired stools are ideal for daily use or special occasions. Their minimalist style and cut-out top make them easy to stack and store when not needed. Purchased two seats for my kitchen island. They are the perfect height and are surprisingly comfortable for metal chairs. I have had them for about a year now and through wear and tear they look new. Really nice! These stools are sturdy and impressively heavy. They won't scratch hardwood floors. The color, however, is not a matte gray. The actual stool is dark metallic gray paint, like a car paint, that has a bit of a sparkle in it. The chairs are much nicer than the picture, more of a dark steely tone, and the paint is a high quality paint that won't scratch off. They look great with stainless steel appliances, adding depth and contrast to the silver tone of stainless steel. Great stools for standard countertop height. Love the charcoal grey! Exactly what I was looking for: Counter-height, simple but stylish, sturdy stools to go under my breakfast bar. They came fully assembled, no scratches. They are comfortable, sturdy, well-constructed, easy to wipe clean, and I love the middle space on the seat for a handle (makes them easy to move/stack). Everyone from my 2 year old to my 250-lb husband sits in them comfortably. And the price and quality were amazing: I saw similar stools in stores for at least $** more per stool. The color is great, too, a nice dark grey with a slight sheen to it. Blends in well with my dark counters and light-painted room. Overall, I would highly recommend. After looking on and off for years, I have found the comfortable, stylish counter stools I have been searching for. I did not want stools with backs on them; I find them awkward and they look too busy in my open kitchen/breakfast/sunroom space. For years I have been satisfied with simple natural wood stools as far as function, but unhappy with them from a style perspective. These charcoal colored tabouret stools are lightweight but sturdy and extremely comfortable, for the grandchildren and the adults who always find my kitchen counter the first place to perch when visiting. The charcoal color blends well with my decor, light cabinets black appliances and a dark countertop. As much as I love color I did not need for eyes to be drawn to counterstools upon entering my kitchen space. I am very happy on every level with my purchase! I bought four of these charcoal gray metal counter stools for my kitchen. They are both comfortable and durable. I am really happy with this purchase. I received my stools in a very timely fashion. I ordered four, one came with a bent leg. Dimensions is the company that manufactures these and there was a sheet in the box to call them before contacting Overstock. I did and they were great. They didn't have any on hand but as soon as one came in, it would be sent to me. I am in no hurry so this wasn't an issue for me. I didn't even have to return the one with the bent leg which is still usable, just not what I wanted. The color is great. They are solid and the knobs on the end will protect the floors. They are comfy for being metal. I would buy again! Stools are well built and the color is very industrial grey. Exactly what I needed to offset a dark brown leather sectional. I am buying another set as the are easily carried and make a perfect extra seat. Counter stools are good looking at my small kitchen bar. The charcoal grey is darker than my stainless steel appliances but I like the contrast. They have floor protectors on the feet and can be stacked. I like that they don't take up much space. Great quality, value and style. 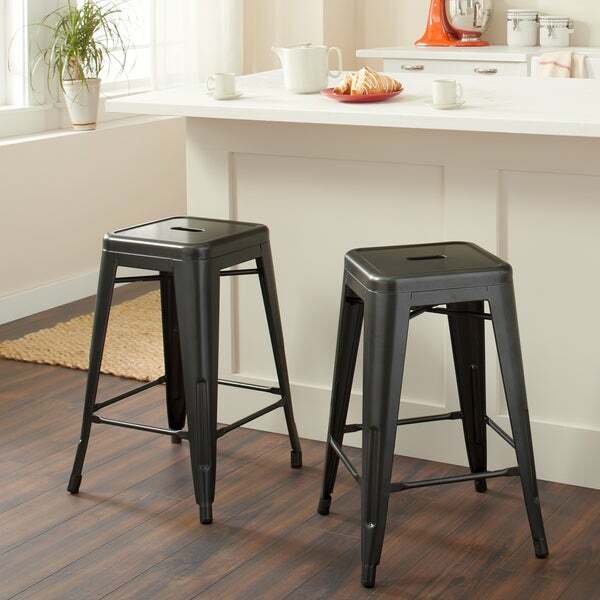 These counter stools are one of Overstock's best bargains. They are well made, stylish and a great value. The counter height fits perfectly at a breakfast bar and the handles make for easy portability. The charcoal grey finish adds an industrial edge to my kitchen and works well with just about any decor. I wasn't expecting much but liked these so much I came back and ordered two more. If they fit what you are looking for, you won't be disappointed. Love these!!! They do show fingerprints if you have young kids, but they are also indestructible and wipe up easily so they are well worth the money. They look great too! Fits my small kitchen island perfectly... love the color and metal. When I started the hunt for counter stools, I wasn't sure exactly what I was looking for - turns out it was these little buggers! They are exactly what I needed and require no assembly. Love them. I bought 4 of them head stools and love hem! They are perfect height for my new kitchen bar/island and are the perfect color! Very comfortable and lightweight but yet very sturdy! Great purchase! perfect size and match to my rustic, reclaimed wood island table. The best part is they came totally assembled! I bout these stools a couple of years ago and they have held up great and also look great in my kitchen. highly recommend. No assembly required! They were durable and ready to go. Love the color. Beautiful and functional. It has a nice industrial look and looks nice within the space. Comfortable enough and easy to wipe down. Definitely recommend!. Great looking stools! Very durable! love these! they are the perfect height and came in already put together. They look great with the room and are comfortable! I think they are a great purchase if you want something sleek and trendy for a island or bar top. I purchased four of these to slide under a dining pub height table that I own. They save space and are comfortable. The charcoal grey color is accurate too. These stools are the best! Nothing to put together (arrives assembled), solid, holds my 200# husband, nice dark gray color, aesthetically pleasing and they stack nicely if you need to store them away- very pleased with this purchase!!! Have been great. Sturdy and practical. "Do these come in black?" There is a black option under item number 4250368. "The bottom of my countertop is 34 from the floor. What height bar stool should I purchase?" The 24 inch stools should be just right for a 34 inch counter. A 30 inch stool would not leave sufficient room for your legs. "Hi. Are these sold individually? I already bought a pair, but I have room for one more in my seating area. Thanks"
Unfortunately. they are only sold as a set. "Hi. Do these chairs look more grey or black in color?" "What is the weight of each chair, please?" The shipping weight of the set is 25 pounds. Hello bichos, the stools are stackable. Thanks for shopping with us! Perfect for my patio bar. Good construction and stack nicely for storage. I HAVE ONE I BROUGHT DURING CHRISTMAS AND VERY GOOD TO BE SITTING IN THE KITCHEN TALKING LOVE IT !